Honey is unwrapped from her long sleep. Honey woke, but didn't open her eyes for a moment. "Should we move her?" It was a whisper, Dreamflight's voice, and Honey was gratified by the worry in it. "When will she wake up?" Greenweave, anxious. No one answered him, but there was a sound that may have been a tired shrug. "She wouldn't like to wake up here." That was Thornbow. Honey furrowed her brow, trying to remember through a fog where she was, that her brother thought she wouldn't want to wake there. Cloudfern's den? Had he concocted some new herbal brew to break her fever? She remembered the fever - the heat and delirium and itchy discomfort of her brain - and she frowned to think that she owed him some gratitude for how much better and clearer she felt, now. The headache that been plaguing her for days had finally lifted, and breathing felt easy again. "She moved," Dreamflight said eagerly. Honey felt a hand take her own, and opened her eyes to find her daughter, smiling and crying over her. "My little bird," she said softly, smiling back. "Why are... what happened to your hair?" He was there, of course, and came closer to her side to take her other hand. He did not send in return, but he murmured at her, something comforting that she couldn't hear for the roaring in her ears. It was wrapstuff, clinging to her fingers. She was not at all in her own den, but somewhere deep in the ground between the dentrees, with other wrap-stuffed bodies - a room that would make her shriek with fright as a cub. She'd been here... asleep like them. There was a brief moment of disbelief, then terror that finally ebbed away into a numb confusion. Dreamflight's tears. Thornbow's look of relief. Greenweave's look of guilt. Windburn, looking anxious and chiefly. And Willow. The ginger-haired elf was kneeling, exhaustion in every slope of her shoulders. Her hair was much longer than it ought to be. Years longer. When had she started wearing it in a braid? It was easier to think about Willow�s braid than the implication of her presence � she must be a healer now. There was someone distinctly missing from the room, if she were being woken out of a wrap-stuff sleep. She found Thornbow's gaze. "Fa-father?" Greenweave's hands tightened on hers. Thornbow edged around Dreamflight in the narrow room and sat down on the low bower behind her. "I�m sorry, Honey, sweetheart, he�s gone." "Who else... how long.. how?" Honey found it difficult to form words, and clung to the hands of her daughter and lifemate. Dreamflight and Thornbow tumbled over themselves to answer, with equal parts bad news and good. Eights of years had passed. Dreamberry was gone, and Cider, two of her closest friends, in the same fire that had taken her father, along with Bearheart, Rhythm and Ringtail. Whitestag had died in a hunting accident, and Bowflight, later. But also in that time she slept, four cubs had been born, and one of them had even grown up already. "Crackle will ask you a lot of questions," Dreamflight warned her, and the others seemed to find that funny. There had been years of bounty, and they spoke cheerfully of game and harvests. Greenweave didn't say anything, only held her hand and let her daughter and her brother catch her up on all the news. And then, a conversational pause turned into a different silence, and no one would look at her. An expectant silence, and Greenweave's fingers threatened to cut off the circulation in her hand. He'd been... so quiet during all of this. **Arn? ** Her sending was purposeful, questioning. What was it that they didn't want to tell her? In sending, there was only truth, and Greenweave's wordless sending was all truth: guilt, apology, resolve, affection, and underlying it all, a dreadful clarity that Honey didn't want to face. It was a spring-flooded river, and she could only cling to the dead wood on the surface. "You didn't wait for me," she was startled enough to say out loud, snatching both hands back for herself. Honey pushed herself away, violently, off of the bench entirely and into Thornbow, who scrambled to catch her. He was pushed away with only slightly less vehemence. Teeth bared, Honey stood on legs that felt weak from bedrest and concentrated on not swaying in place. Cornered, with no easy escape in the tiny room, she stood there a long, silent moment while the others exchanged looks thick with regrets. "You didn't even want to wake me up, did you," she accused generally. "It would have been easier for everyone involved if I'd just continued sleeping. You should have let me just die in the first place, if you wanted me out of the way that badly." She turned to Willow, who had remained kneeling, as far out of the way as she could be. "Why did you have to heal me at all?" she asked, spitting with anger. "You've caused more pain than you've eased." They reached for her, hands outstretched in what was probably meant as comfort. Honey slapped the nearest ones away, then made a jerky lunge for Thornbow's belt and snatched his knapped knife from its hilt before anyone could think to stop her. They uniformly drew back in alarm, and Dreamflight said in panic, "Mother, no!" Honey hadn't even considered the idea of taking her own life until she saw their reaction. She took her hair in her free hand, and chopped it off viciously. As a dramatic gesture, it didn't work as well as she'd hoped. The knife was not sharp enough for a particularly clean cut, so it snagged and grabbed and tore as much as it cut, and she knew the look was not graceful as she sawed desperately at the hair. It added as many tears to her eyes as the whole wretched waking already had, and she made no effort to stem them or wipe them away. 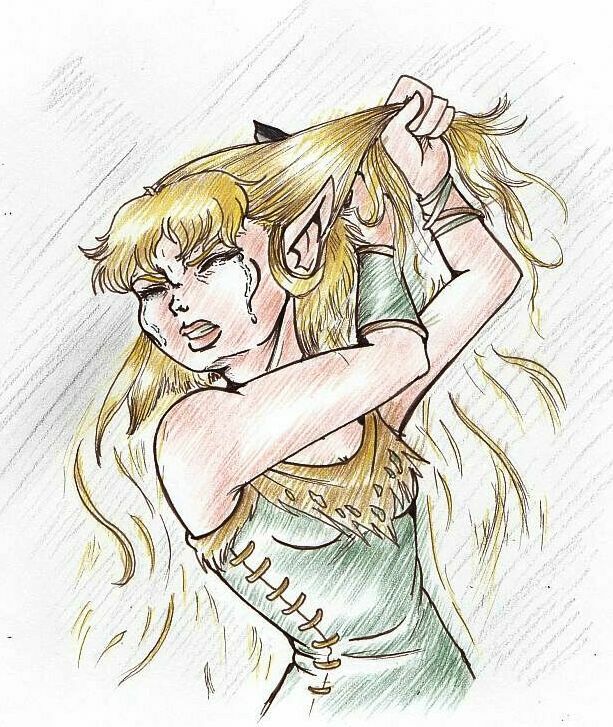 "I only wore my hair long for you," she spat at Greenweave. "I'll be dead before I ever do anything for you again. Ever." She flung the hair that she did manage to cut off at him, dropping the knife carelessly, and would have stormed immediately to the closest entrance to the den if Dreamflight had not been in her way. "You," she said furiously to her daughter. "What did you do to keep our family together? Did you even try? Did you take your head down out of the clouds for one moment to think about anyone but yourself?" Dreamflight, eyes wide, protested, "Mother, it wasn't like that..."
But Honey only bore down on both of them, knowing that neither would try hard to stop her, aiming for the exit and using words as a battering ram towards her goal. "You never could keep your mind on anything longer than a few days, could you? Clearly, you got that from your father." Thornbow tried to take her arm, but Honey shook it off, still staring in astonishment at the elf that she thought was her lifemate. This was not roll-over, peace-keeper Greenweave. His betrayal was one thing � and High Ones, that unfaithfullness stung � but this new defiance of his was something worse and more unsteadying. She couldn�t even formulate coherent ideas to send back at him, and she shook before the strength of his gaze and after a moment, couldn�t keep her eyes locked on him. Dreamflight seemed as astonished by Greenweave�s defense as Honey was, but Honey was too filled with panic and feelings of flight to stop to unravel this new confusion, so she turned to Willow, who was still kneeling in the only other available space between herself and outside. �This is your fault!� she cried, and she shoved past awkwardly and escaped up the winding tunnel � to even worse humiliation. The holt had gathered to greet her. Why they would expect a happy reunion with her was beyond Honey's comprehension, but there they were, looking uncomfortable and awkward, and all wrong. Who was the tall elf youth who looked so gawky and curious? Had Windsong abandoned her trademark braids? How different they all looked, older in some cases, with abrupt changes from the clothing Honey had seen them in only a day before. Even the weather was wrong � it had been barely into spring, and now was bursting into summer. It was like some kind of awful prank, and they all seemed to be just now realizing that her waking was not the celebration they had planned for. She stood in front of them, keenly aware that she must look a complete fool. Not only was she learning only now about the betrayal and abandonment that had happened to her decades ago, but she was doing it in a small shift that reeked of fever and bore sweat stains, red-eyed, with her messy hair half-hacked off at her jawline, in front of the entire Holt. Windburn had followed her out. "Welcome back, Honey," he started, in a firm oratory voice, and he probably would have said more of whatever it was that he had clearly prepared, but Honey lifted a quavering hand to stop him. "Don't," she said. "Just, don't." 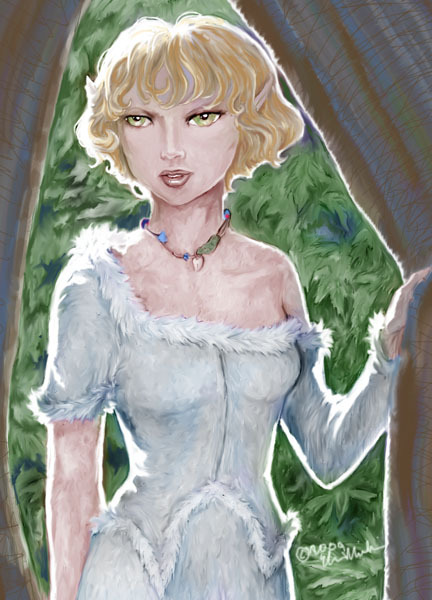 She pushed away from the doorway, and the elves parted before her silently. Some of them touched her as she walked past with her chin high, but she couldn't get past the abandonment and shame that she felt to greet them in return. Their eagerness to see her seemed somehow misplaced. Nightstorm did not part before her, but blocked her path with open hands. "Honey, darling, we have got clothing to make." Honey's resistance was gone. She numbly let Nightstorm and Whispersilk lead her away. Whispersilk trimmed her hair into a tidy bob, to match the shortest of the hairs she had so clumsily hacked off. It was shorter than Honey had worn it in eights of years. Since before she�d Recognized Greenweave. Nightstorm held up a bolt of green cloth and a slash of red-dyed leather. "How about this combination?" she offered. "It's very dramatic." Honey must have looked unconvinced. Whispersilk took the leather from Nightstorm and held up a purple piece, instead. "This combination would look lovely. Maybe something with a high neck, to show off your new hair cut?" Honey liked the colors for a moment, then remembered that Cloudfern often wore the green and purple combination and her chest hurt so badly that she could barely breathe. She shook her head. "Too much... color," she said weakly. She didn't feel like color, she felt like a ghost. Like fog. She lifted a folded piece of deerskin that had been bleached in preparation for dyeing. "We could dye you something special," Nightstorm offered at once. "Maybe something with a gradient, even - maybe an orange that goes to red at the edges?" Honey was already unfolding, gauging how much was there... not enough for two long sleeves, but maybe for one. "No," she said quietly. "Just like this." Nightstorm and Whispersilk exchanged a quick look. "It might be hard to keep clean," Whispersilk cautioned. "I don't care." It was already worked to an ultrasoft suede, and Honey stroked it with her fingers. It was as soft and pure as the wrapstuff she had spent these last years in; it was perfect to be the clothing she woke up to. Nightstorm grinned and shrugged, then gasped and said eagerly, "Oh! I've got some winter ermine furs that I've been saving for something special. They would be perfect for some trim around the neck. At the wrists, even, if there's enough." She dove into one of her project piles, and came up clutching them. It took the rest of the night and hours into the next day. Whispersilk excused herself shortly after dawn, and Nightstorm was yawning, by the end of it, but Honey had no desire to sleep again. Ever, if she had her own way. When Dreamflight came creeping up the gnarled branches to the entrance to Nightstorm's den, Honey stepped out into the sunshine to greet her. She liked the way the ends of her curls caught the light in the corners of her eyes, and the soft sheen of the fitted, fur-trimmed garment that hugged her waist and covered one shoulder. This was the way she should have greeted her tribemates after her long sleep. Dreamflight stared for a long moment. "Isn't it beautiful?" Nightstorm asked proudly, coming out to show off the new creation. Honey tried to smile, and must have succeeded a little. "Thank you, Goldfinch." Her use of the cubname was apologetic, and she opened her arms to give Dreamflight a fast, affectionate embrace. She did not offer an apology, but her daughter didn't seem to expect one, and their argument flowed away like water in the river. It was imperfect, this strange not-really-home Holt that was so different from the place Honey had gone to sleep in, but she felt more ready to face it now.